Mental activities burn around 300 calories per day and every day at ESSEC, numerous brilliant young minds spend hours burning calories in the library and in the classrooms. But where do these calories come from? 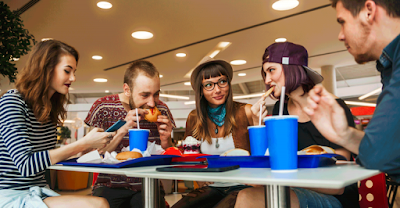 Or more simply put: what and where do ESSEC students eat? Luckily for them, the campus offers a good array of options to maintain a balanced diet. The first place one discovers when beginning his or her studies in Cergy, is the DeliMarché (aka, the university canteen), located next to the cafeteria and therefore also the closest and most comfortable option. This is especially convenient during days when the lunch break is squeezed in between two classes. One would think that in 2017 university canteens would have mastered the art of providing tasty meals to students, but unfortunately this is not the case. I will soon be clear that finding a meal that is not soaked in butter, overcooked, or accompanied by some mysterious sauce is a rare event but hey, somethings got to give! Should you look for something a bit more refined, you might want to try out the canteen upstairs. Be warned though, higher quality means higher price, and the seats are reserved to professors and MBA students by right of seniority. After getting acquainted with the surroundings, you will find out that in the park behind ESSEC there is the Restaurant Universitaire (or Resto-U). Despite its name, it is a dark and gloomy canteen offering student-ish meal deals: you can purchase a full meal, from appetizer to dessert, for the bargain price of 3.25! After a few meals here, you will understand that being hungry is pretty much like being in love: exterior appearance is not that important after all. In the era of Pinterest and Tasty, being creative in the kitchen has never been so easy. So why not investing a couple of minutes in chopping and mixing some fresh ingredients at home so to have a perfectly instagrammable takeaway lunch for the next day?! The greedy looks of your friends will make your day! When sitting in the cafeteria, you will also see several people carrying a red or a brown paper bag and you will also notice that those bags smell reeeeeeally good. In fact, right across ESSEC’s main entrance, there is Pomme de Pain (literally the “Apple of Bread”) and a little further you can find Cezam (literally meaning the ‘brown bag’). These two heavenly places are best friends to hungry students. The first one offers a variety of pretty-much-healthy sandwiches and tempting viennoiseries to be packed in a red paper bag to go. The latter one instead is more like a yummy fast food and believe me, you might want to keep it for those afternoons in which you can afford to be sleepy. When you’ll feel brave enough to go even further and will have a long lunch break, you can explore the little brasseries and cafés located in and around the shopping mall “Les Trois Fontaines”. Thai, French, Italian, and many more types of different cuisines can be discovered in these hidden places, you just need to look for them. The walking distance (a few hundred meters) might discourage the laziest students on campus, but we all know that it is important to include some physical activity in our daily routine, so why not? Finally, before going back to studying, you should never forget to conclude your meal with a coffee and something sweet from the DeliCafé, the cafeteria: after all this food you wouldn’t want to fall asleep in the middle of a lecture, would you? Welcome to our blog where you can follow the adventures of students' enrolled in the MSc in Management. Ranked #3 worldwide by the Financial Times, the MSc in Management is a flexible, personalised and career-focused programme with great international exposure. ESSEC GROUP 2014-15 ©. Picture Window theme. Powered by Blogger.